Congratulations to our winners The Wesley Chapel G.R.I.T.S. 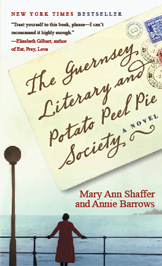 book club from Union County, North Carolina who will be off to visit the wonderful Island of Guernsey this October! Standing in the back row from left to right is Mary Bonelli and Len Efird. Sitting in the front row from left to right is Elaine Rosoff, Lisa Conway (center) and Janet Brower. Please note that Donna McClung and Kerry DeStefano are not present in this photo. Grand Prize Winner will be notified by e-mail on or about August 17, 2009 and First Prize Winners will be notified by e-mail on or about August 24th, 2009. For the names of the Winners, available after September 30, 2009, send a self-addressed, stamped envelope to: “Take Your Book Club to Guernsey” Winners, 1745 Broadway, 22nd Floor, New York, NY 10019, Attn: Rochelle Clark. Requests must be received by October 31, 2009.